U.S. biofuel policy will determine the fate of a very diverse group of companies in that space, from the first generation, which produces fuel from corn and soy beans, to the next generation, which is working on fuel made from feedstocks like waste and algae. Both generations know that the right policy could mean the difference between success and failure, and so are spending millions on lobbying, albeit for very different — almost opposing — purposes. According to the Center for Responsive Politics, a nonprofit, nonpartisan finance research firm, companies that make up the traditional corn ethanol and biodiesel industries spent $7.03 million on lobbying for all of 2007 and the first quarter of 2008. 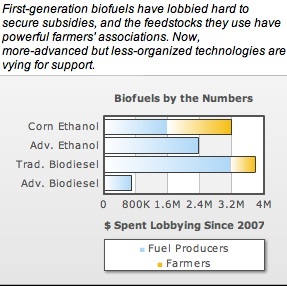 Of that, biodiesel producers spent the most ($3.2 million), followed by corn ethanol producers ($1.6 million) and corn farmers with ($1.6 million), and finally farmers that sell to biodiesel makers ($625,000). Those funds are largely being spent in an effort to hold on to the biofuel subsidies that are already in place, but are facing increased skepticism and fading political good will. The Farm Bill will cut the subsidies for corn-based ethanol and double the subsidies for biofuels from alternative next-gen sources. Critics of corn ethanol have also called for an elimination of corn ethanol incentives in the Energy Bill. On the other hand, companies that are building the next-generation biofuel industry, with feedstocks as diverse as municipal waste, algae, and non-food energy crops, are spending money to try to differentiate themselves from the corn-ethanol crew. But they don’t seem have the necessary funds quite yet. The next-gen biofuel industry spent $3.08 million on lobbying since the beginning of 2007, says the Center for Responsive Politics. That’s less than half of what the traditional biofuel industry spent on lobbying. The next-gen industry is just too new and too diverse to be able to match the funds of the first-generation folks. Fuel producers of next-gen ethanol spent $2.4 million, while fuel producers for next-gen biodiesel spent $680,000. Though, as the next-gen companies raise more funds from investors and start to get some of their plants built, those lobbying figures will likely only go up. To put all of this in perspective: The incumbent oil and gas industries spent almost $110 million on lobbying for the same period, according to the Center for Responsive Politics — roughly 10 times the amount that the combined biofuel industry. Graph courtesy of the Center for Responsive Politics.